A share of stock represents ownership in a company. Companies issue stock to raise money to start or expand their businesses. Companies sometimes use profits to pay dividends to people who own their stock. People trade shares of stock on stock exchanges. The price of a stock can go up or down depending on a company’s success, so there is risk in owning stock. Many people own stocks by investing in mutual funds. 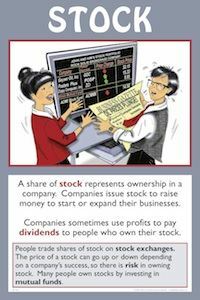 Stocks represent shares of ownership in a company and are issued to finance business operations. Stocks are first issued by using an IPO – an initial public offering. After that, stocks are traded on various stock exchanges (secondary markets), such as the New York Stock Exchange (NYSE) and the NASDAQ (National Association of Securities Dealers Automated Quotation system). Stock owners hope that the value of their shares will increase as a company grows and prospers. When a person sells a stock at a price higher than the purchase price, that person earns capital gains. Companies often use some of their profits to pay stockholders dividends, although some stocks (such as growth stocks) seldom or never pay dividends. Growth stocks usually represent smaller, faster growing companies that reinvest all their profits into the company. Income stocks, on the other hand, pay dividends regularly and represent larger, more established companies. Another term used to describe some stocks is value stock. A value stock represents a company that is believed by analysts to be underpriced relative to the stock’s fundamentals (earnings, dividends, sales, etc. ), usually because of underlying problems or limited growth prospects. A penny stock generally refers to a low-priced (under $5), speculative security of a very small company. Penny stocks are, of course, very risky. A mutual fund is an investment company that brings together money from many people and invests it in stocks, bonds, or other assets. Mutual funds allow an investor to diversify assets, offer professional management, and are relatively simple to invest in. However, there are a variety of fees that an investor pays when investing in a mutual fund. Stocks can be risky, but they have the potential for significant long-term gain. Consider having your students play the Stock Market Game™. Working in teams, students invest an imaginary $100,000 and compete to see which team can increase their portfolio of stocks in a 10-week period. An excellent Teacher Support Center with many age-appropriate lessons is available for teachers who participate. Have teams of students track a portfolio of stocks they choose. Make sure they involve parents/family members! This gets the whole family involved. Have students check out some sites that provide financial information, such as Yahoo Finance, Smart Money, or The Mint. Have your students use a Financial Calculator to see how the rate of return affects how fast your savings/investments grow. Students will understand that although stocks are more risky than some other investments, the long run return on stocks (about 10% since the Great Depression) makes them an attractive investment for a person willing to invest over a long period of time.